Maximize the performance of your camera or camcorder with the SanDisk Ultra microSDHC and microSDXC Class 10 UHS-I Memory Card. Ideal for compact to mid-range point-and-shoot cameras, this versatile microSD card comes with an SD card adapter for compatibility with SD-enabled devices, such as cameras, camcorders, and laptops. With its exceptional data transfer speeds, the card captures photos twice as fast as ordinary memory cards and supports Full HD (1080p) video capture. This memory card features Class 10 and UHS Speed Class 1 (U1) video ratings -- the fastest classifications available for a microSD card. You'll be ready to capture cinema quality 3D and Full HD** video (1080p) without dropouts and stuttering. With transfer speeds of up to 30MB/s** , the card brings faster read and write speeds to your camera or HD camcorder. Up to twice as fast as an ordinary memory card, the SanDisk Ultra microSDHC and microSDXC memory card enables you to quickly snap continuous pictures so you'll never miss a moment. 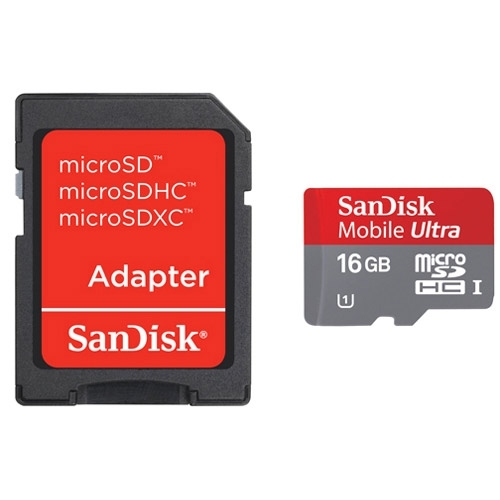 Available in sizes up to 64GB**, the SanDisk UltramicroSDHC and microSDXC card has plenty of room to accommodate HD videos, high-resolution photos, and other memory-intensive files. This microSD card comes with a convenient SD card adapter, so you can capture and access data on the card with any device with an SD card slot. You'll be able to use your card with SD enabled cameras, camcorders, tablets, and laptops. The SanDisk Ultra microSDHC and microSDXC UHS-I Memory Card captures photos in all conditions with its shockproof, waterproof, and X-ray-proof design. You'll never have to miss those moments even in extreme temperatures from -13 to 185 degrees Fahrenheit. The SanDisk Ultra microSDHC/microSDXC UHS-I Card is backed by a lifetime limited warranty.